SHOW DOG TRAINING: PRACTICE PREVENTS DREADLOCK! Muscles have memory but a short circuit between brain and auto-reflexes can cause a puppy to freeze at his first dog show. 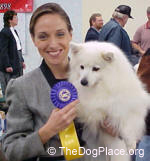 Everyone has had a puppy or young dog "freeze" during training practice, especially at a dog show! It happens when the puppy's brain and sensory receptors go on overload. If you understand what causes dreadlock and how to prevent it, people will marvel at your show training. Bask in the wins and compliments but help other show dogs by sharing this article on how the brain controls muscle reflexes. 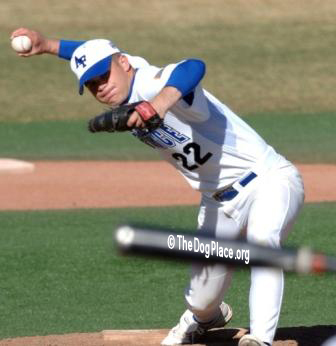 A pitcher's arm knows exactly how to wind up and deliver the ball without conscious thought. The eyes, brain, muscles, ligaments, and nerve endings carry out a memorized sequence that sends the ball across the plate. Perfect synchronization can be affected by stress, fatigue, or other external factors but when cellular memory works, a miracle occurs and a strike is delivered. That's why practice makes perfect. Muscles actually have their own memory and can perform repetitive motions with very little input from the conscious brain. Your eye, brain, arms, leg, and brake-foot know just how to slow the car and make a left turn without conscious direction from your brain. A puppy that has been correctly trained to gait, bait, and self-stack is a puppy whose little legs can carry on even when his brain is saturated with stressful input. In fact, a mentally conditioned youngster is actually comforted by performing what he knows brings praise and reassurance. Without that repetitive conditioning, fright interferes with the brain's ability to recall and transmit information and the cessation of signals causes puppy to freeze. If the brain remains "stumped" for more than a few seconds, it catalogs the cause and puppy will react badly when confronted with a similar situation. The correct response is to distract him; stoop down and discover a bug in the grass, roll his ball in front of him, and act as though the episode is "no big deal." If he doesn't recover within 90 seconds, pick him up and walk away from the "bad place." If he's too heavy, just sit quietly with him and wait. Never scold a puppy in dreadlock. That will cause even more neurons to fire, cataloging the show situation as something to be avoided, thereby exacerbating what should have been a small problem. Do not coax or praise him. Reinforcement of helpless behavior may cause the brain to catalog it as a solution when faced with future over-stimulation. There is a tenuous line between reassurance and praise. To properly cope with such a delicate problem, you must understand the mechanics involved. 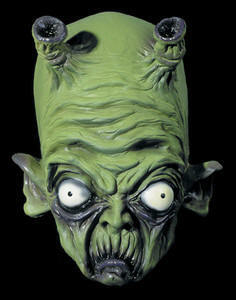 Imagine answering your door and being confronted by a Martian. Your cognitive process is so startled, it either commands you to flee or it shuts down. Similarly, your pup can be overwhelmed by his first dog show or an unexpected fright such as a dog jumping at him. His brain is receiving overwhelming sensory input and like a little computer, it races to attach those signals to memory cells. If it finds "no matches" it rejects "dog show" just as your brain would initially refuse to deal with the green space man. Your subconscious will finally say "ah ha, this looks like something I've seen on TV" and depending on your past experience and stored perceptions, you will either invite the creature in for tea - or run like hell! 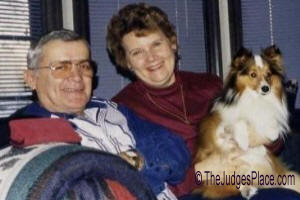 If your dog's memory can't connect to a positive output when he gets to the "dog show" he's likely to panic. Flight, Fight, or Freeze. Adrenaline is being pumped into the body, so he goes into a shocky shut-down. Dreadlock. Optimally, the brain assures the pup (or you with the Martian at your door) that all is familiar, i.e. okay, and spiked heart rate, respiration, and adrenaline levels return to normal. Puppy will be bit shaky after the fright-flight experience but he should snap back to normal quickly if YOU act normal. There are ways to prevent Dreadlock. You've seen pups being dragged, choking, around the grounds. The show place and everything about it is being recorded as a torturous experience. What could have been a fun outing is remembered as a long weekend of confinement, rumbling gut, full bladder, scolding, threats, and well, now you understand why a promising youngster becomes hopelessly turned off on shows. On the other hand, if Puppy links dog shows with people laughing, lots of attention, treats, and praise, the experience becomes a positive memory that lasts a lifetime. If he is small, carry him into the crowd, under the tent, through the building, etc. keeping the experience short and positive. Our secret to confident show dogs is simple; make sure Puppy gets to explore the show grounds the night before or early in the morning before things get going. If you are late arriving, at least take him to a relaxed, pleasant, peripheral area so that he can absorb the scary surroundings and escape unscathed back to your setup. Let his brain catalog that short experience, then take him on another scouting trip, a happy walk that ends with a calm stroll back to the security of his crate. 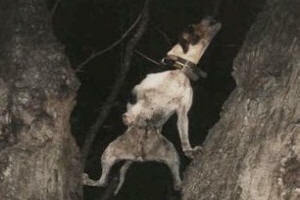 The wise trainer will take him back and forth repeatedly, using bait and praise after the pup is comfortable. During relaxed, fun trips to ringside, Puppy's brain imprints layer upon layer of pleasant data which will reassure him when he's rushed to the same ringside by a nervous handler. Repetition. Practice. Conditioning the brain so that it passes correct messages to the body. Only then can Puppy begin to automatically shift weight, straighten a leg, and assume the show pose you've spent hours teaching him. If he's bunched up tight, adrenaline pumping, the brain having signaled muscles into the flight mode, he cannot extend the legs into that effortless gait that makes you proud. And of course he'll refuse bait. He can't eat when he may have to flee at any minute! Now you understand. Isn't it amazing that in spite of all that's going on, he looks up at you and manages to wag his tail? If your car had so many things malfunctioning at once, the engine would quit. Your puppy's system may be misfiring but if he's been practiced by an owner who understands that positive practice prevents dreadlock, he'll keep firing on all cylinders and having fun doing it!